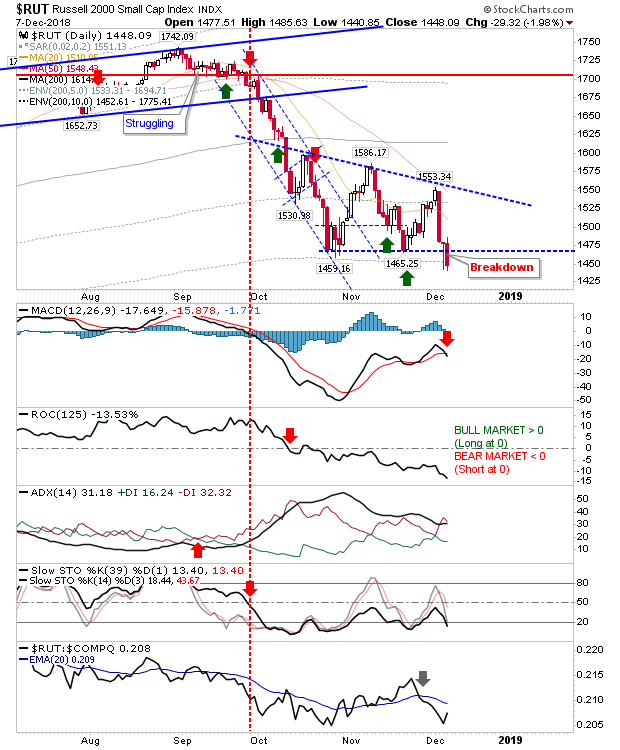 Russell 2000 Breaks Support; Other Indices To Follow? A tough close for markets on Friday. 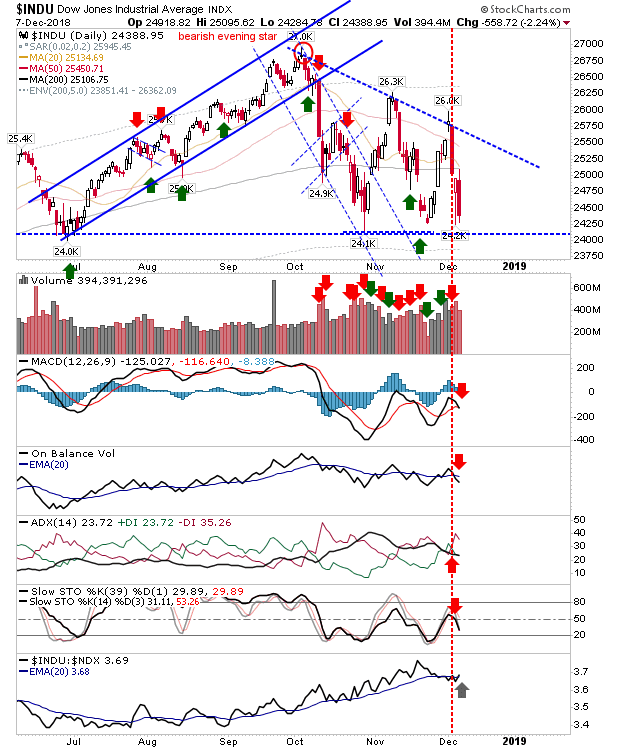 The week finished with a decisive break of support for the Russell 2000 which undercut the prior double bottom - this sets of a bad precedent for other indices. There is still a chance for a 'bear trap' but markets will need to recover 1,465 over the next few days - Monday preferably. To add insult to injury, technicals are all net negative and relative performance accelerated lower. The Dow gave up over 2% but didn't break support. I would be looking for a test of the July swing low as part of the descending triangle taking shape in the index since October. The index hasn't lost much ground relative to its 200-day MA and because of this it actually enjoyed a relative strength uptick despite Friday's losses. The S&P only has the November spike low to hang on to as it struggles to build any upside momentum.A 'death cross' between the 50-day MA and 200-day MA is confirmed. While there are 'sell' triggers in On-Balance-Volume, -DI/+DI and slow stochastics, relative performance remains good (vs Russell 2000) and the MACD is clinging on to the November 'buy' signal. The Nasdaq remains a mix of bullish and bearish signals with the November swing low still a viable defense. 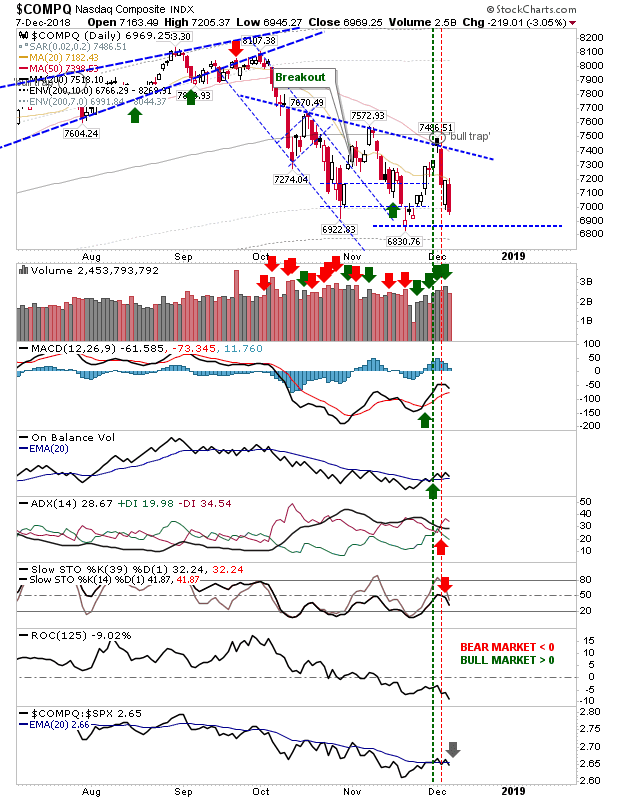 Bullish signals remain for the MACD and On-Balance-Volume although relative performance is swinging away from speculative Tech stocks to 'safer' large-cap stocks. With Christmas fast approaching it's looking increasingly unlikely Santa will be paying markets a visit. The best thing bulls could offer markets over the next couple weeks is an extension of current trading ranges. 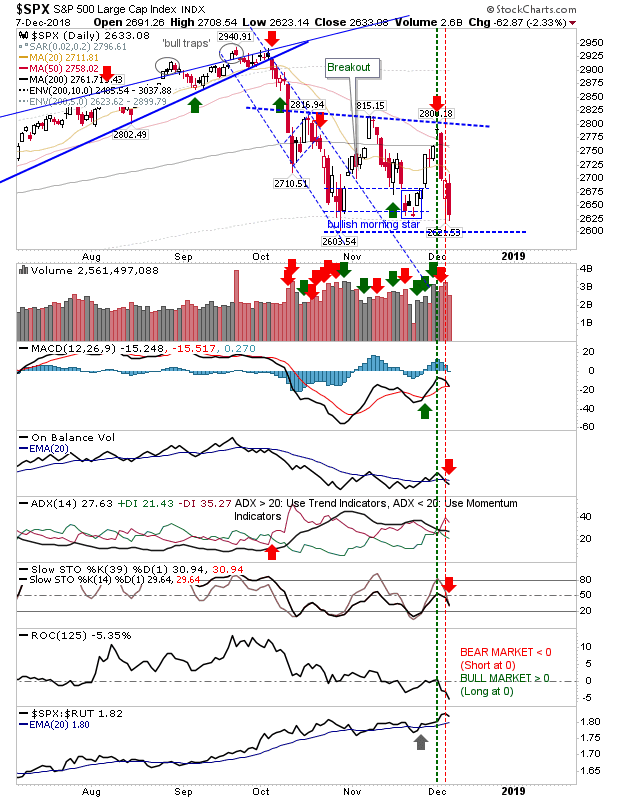 The longer this scenario drags out the more likely we will see markets break lower with a continuation of the sell-off started in September. Given that, action in the Russell 2000 looks to be key for the broader market.